It is said that when you learn a new vocabulary word you suddenly see it everywhere. The same must apply to history because otherwise I would have missed this story entirely. While all the attention lately has been paid (and rightly so) to the discovery of Richard III’s body buried under a Leicester car park, an even more astonishing bit of history has surfaced with the possible identification of a pelvic bone from Alfred the Great. This probably won’t mean a whole lot unless you’re either a) British b) an historian c) an archaeologist but nevertheless, if you’re even curious about any of the above you might wish to learn more about why this is so important. For those who wish to cut to the chase, here are LINK1 and LINK2 to summaries in the British tabloids press. I know, I know. I’m as scandalized as you by the graphics and blatant “click me” opportunities. But somewhere in there is serious journalism and a story worthy of worldwide reporting. Mind you, as I mentioned previously, I’m new to all this Medieval English history stuff but it doesn’t take a genius to recognize how Alfred earned the nickname. a) When England was overrun by large contingents of Vikings, only one kingdom defiantly stood its ground. Yup, that would be Wessex, led by you-know-who. b) Alfred learned his lessons both on and off the battlefield. After near defeat, he reformulated the local armies so barrons would spend half the time away from their domains. He thought not only in terms of what was best militarily, but what would allow his kingdom to remain vital and productive. c) He commissioned the first English navy, hitting upon the idea that it might be a good idea to defeat the Vikings at sea before they reached British soil. While his ship plans weren’t the most seaworthy, he initiated concepts for successive development. d) At a time when few people were literate outside monasteries, he learned Latin and rounded up scholars to translate texts into the vernacular. He was especially fond of Boethius’ Consolations of Philosophy and did the work on that text himself. e) By fathering a competent son, he ensured that his ideas would carry on. 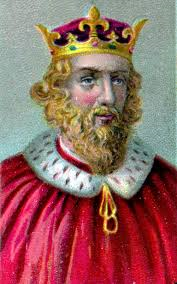 Edward the Elder reconquered the east coast and paved the way for a peace and prosperity under a united England, the first time it had been so since the collapse of the Roman Empire. So yeah, it’s a pretty big deal. And okay, so it’s not exactly Shakespeare news. But I need neither Kevin Bacon nor six degrees to connect the dots. This entry was posted on 2014/02/22 at 8:50 pm and is filed under Context, News with tags Kevin Bacon, King Alfred, Richard III, Six Degrees of Separation. You can follow any responses to this entry through the RSS 2.0 feed. You can leave a response, or trackback from your own site.